Time: Early in spring, often from the 5th to the 15th day of the first lunar month. Objects of worship: Village gods, Mountain and Stream gods. Characteristics: Traditional belief and the cult of fecundity. Participators: The Tay people and other ethnic groups. Contents: Praying for all the good things, con throwing, xoe dancing. On the night before the festival takes place, the representatives of families in the village and sorcerer perform a water procession from the stream to the village. This water is used in the opening ceremony of the festival. The villagers erect an U-shaped altar from bamboo. The bottom of the letter U faces the east. The altar is one meter high and 40 centimeter wide. The offerings of the village are placed on the altar, which include a bowl of water, a plate of red sticky rice, a plate of yellow sticky rice (the red one symbolizes the sun and the yellow one symbolizes the moon), a boiled chicken, grilled fish, a bowl of boiled chicken blood, a sharp knife, a roll of newly-woven cloth, two yellow paper fish, two red paper owls, two racemes of flowers made from parched rice and fruits. The offerings of the families and of the newcomers are also put on the altar. These offerings only include food without a bowl of water, a knife and a dish of chicken’s blood. The opening ceremony begins as a roll of gong beats resounds. The sorcerer performs the rituals to pray for lushly green rice with firm grains, good animal husbandry and good health to everybody. The sorcerer holds the bowl of water in one hand, and the knife in the other hand. He moves the knife four times above the water bowl and draw horizontal and vertical lines according to four directions of the east, west, south and north. When the sorcerer finishes the rites at the altar, he continues to conduct the rituals at con tree (a tall bamboo pole). After he says his prayers, he tosses two con balls into the air so that young men compete to catch them. Anyone who catches a ball first will be the first to take part in the game. Participants have to throw the ball through the bamboo ring. Successful competitor is the one whose ball pierces through the sheet paper covering the bamboo ring. The winner receives a prize. The sorcerer slashes the ball open, and mixes the seeds inside the ball with a basket of paddy and distributes them to everybody. After the con throwing game are tug of war and xoe dance, which lasts until the afternoon. 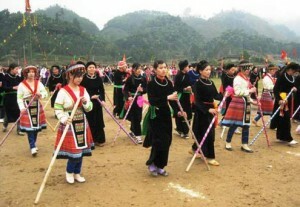 Long Tong Festival is a unique cultural activity of the Tay ethnic group in North Vietnam.